Listen to Ensemble Hilka on WNYC’s Soundcheck live on the air! (Broadcast on Nov 28, 2011). 2011 marked the 25th Anniversary of the Chornobyl Disaster that irrevocably transformed the ecological and social dimensions of life in the Ukrainian and Belarusian regions now known as the “Chornobyl Zone.” Since 1986, the traditional communities of the Chornobyl zone have been largely dispersed and destroyed, and today, very few people remain in the region. Yet, a trace of the human spirit that used to populate this region remains, in the form of archival field recordings that document the ritual and quotidian aspects of daily life before the disaster. In the 1970s, Ukrainian folklorists and ethnomusicologists such as Yevhen Yefremov conducted numerous field expeditions into the Chornobyl region. 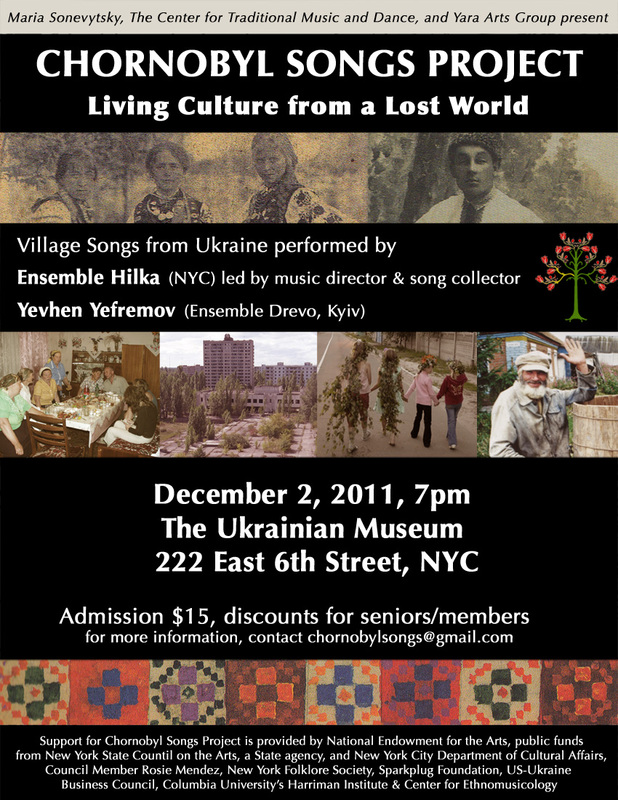 To mark the 25th Anniversary of the Chornobyl disaster, raise awareness of the continuing environmental damage created by the nuclear disaster and stimulate efforts to prevent such catastrophes from occurring in the future, a group of singers based in New York City will reinterpret traditional songs from the Chornobyl region. Through a series of masterclasses with Yevhen Yefremov, a concert program, and a recording, the Chornobyl Songs Project creates awareness not only of the vitality of the local expressive culture that the disaster stamped out, but also of the importance of environmental activism that supports responsible and clean energy. Yevhen Yefremov is a foremost Ukrainian expert in polyphonic singing styles of Central and Northern Ukraine. In addition to his prominence in the Ukrainian academy as pedadogue and writer, he is also the founder of the important revival choir Drevo, which spearheaded much of the revival and interest in village-based singing practices since the dissolution of the Soviet Union. As a graduate student, Yefremov collected songs from the villages in and around Chornobyl, and now holds a rare archive of these nearly lost songs. In November 2011, Yevhen Yefremov traveled to New York City for intensive work with Ensemble Hilka, a new group that includes some of NYC’s most prominent folksingers. From December 1-4, the Chornobyl Songs Project presented a series of concert-performances in Princeton, NJ; New York City (with the Ukrainian Women’s Choir); Philadelphia; and Washington, DC. The project was supported by the Center for Traditional Music and Dance, the Yara Arts Group, the Sparkplug Foundation, the New York Folklore Society, and the US-Ukraine Business Council. The project concluded with a recording of the repertoire, sponsored by the Sparkplug Foundation. The recording was released on Smithsonian Folkways in April of 2015.